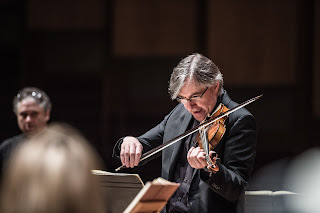 Pavlo Beznosiuk is currently the leader of the Academy of Ancient Music, though he wears a number of other hats too including being director of the Avison Ensemble. Pavlo has been busy on the period performance scene for over 25 years and in fact played with the the Academy of Ancient Music first in 1985! He often directs the Academy of Ancient Music and I met up with Pavlo to find out more about his latest project, Music from the Dark Side. I meet Pavlo for coffee at the National Gallery, and Pavlo comments that he and a group of musicians rather lived here a few years ago when they provided music for the Vermeer and Music exhibition at the National Gallery, performing a huge number of short pop up concerts. This time he is on his way to the Duke of York's Theatre for his first preview of Claire van Kampen's Farinelli and the King; Pavlo is one of team of violinists from the Academy of Ancient Music playing in the show and comments that this will be the longest number of performances of a single piece that he has ever done in one stretch, he will be in 47 of the shows and there are a total of around 100. 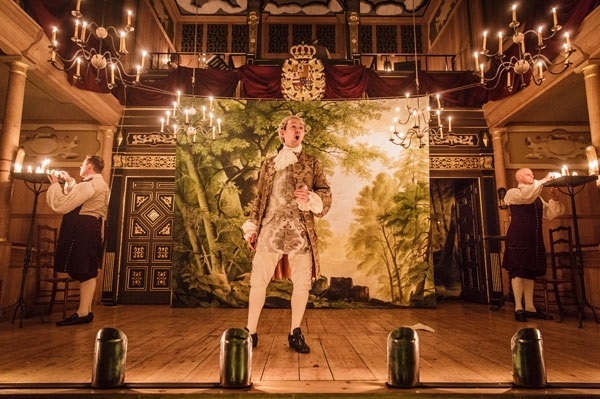 The play by Claire van Kampen features music written for the castrato Farinelli and it opened at the Sam Wanamaker Playhouse earlier this year (see my review). Pavlo comments that there are a few places where the players have a bit of leeway to try and keep it fresh. Pavlo is the leader of the Academy of Ancient Music and will be directing them in their forthcoming concert on 19 October (in London) and 22 October 2015 (in Cambridge) entitled Music from the dark side. 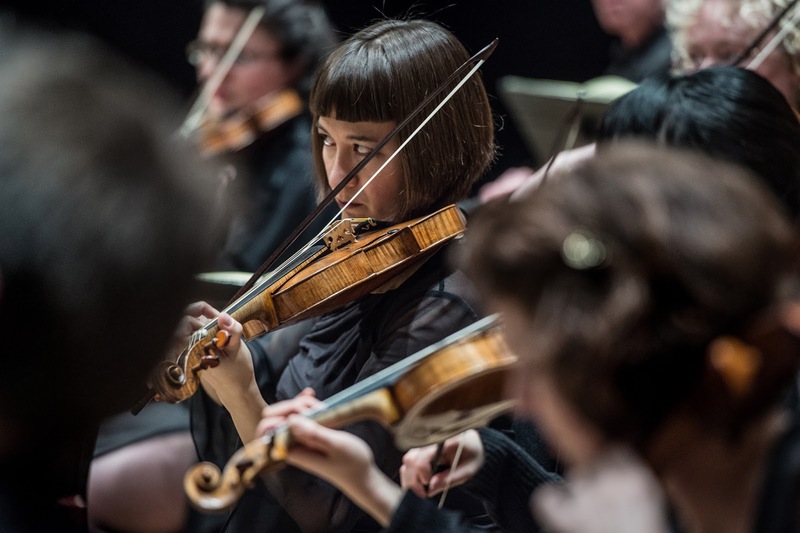 The concert is part of a short series From Darkness to Light in which the orchestra will be taking inspiration from Dante's 14th century poem Divine Comedy and looking at the author's journey through hell (Inferno) and paradise (Paradiso). The artist Monika Beisner will be providing illustrations, a German artist known for her illustrations to children's books and whose illustrations to Dante's Divine Comedy have been published in Germany and Italy. Pavlo had the idea of basing a concert around symphonic works from the classical period written in the minor key, rather surprisingly there are not that many of these and they make a very interesting and dramatic grouping. 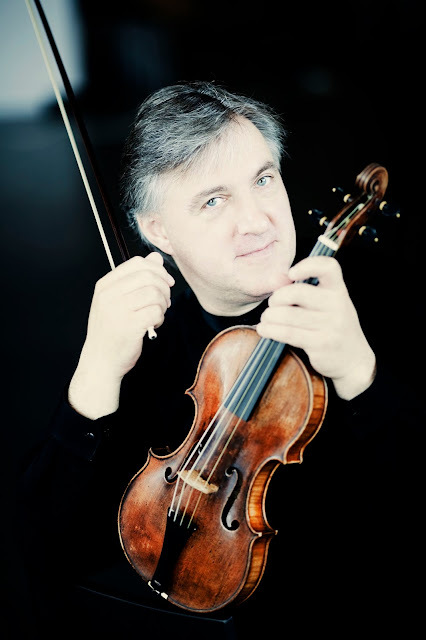 Separately, the second violin of the Academy of Ancient Music, Bojan Cicic, had the idea of a concert based around visions of the spirit world and the after life, Angels and Saints, with music by Vejvanovsky, Manfredini, Biber, Leclair, and Vivaldi. And thus a concert series was born. Pavlo's concert, Music from the Dark Side will contain Haydn's Symphony No.49 in F minor, Joseph Martin Kraus's Symphony in C minor, Franz Benda's Concerto for violin and strings in D minor and Mozart's Symphony No. 25 in G minor. Symphonic music of the period tended to be in major keys and the symphonies preponderantly up-tempo and zippy. Pavlo comments that if the composer (often a member of the ensemble) was bound by duty to entertain his patron and his patron's guests, then there would be few opportunities to write genuinely dark music. Haydn, working for a relatively enlightened patron in Esterhazy wrote a few minor symphonies and his Symphony No. 49 in F minor (quite a dark key when played in an unequal temperament) comes from around the same time as the Farewell Symphony. Whilst the Bohemian composer Franz Benda is a composer of whom I have heard, his concerto is not a work that I know. Benda's symphonies tend to be of the short, up-beat and zippy type but the concerto is something again. There is some indication that Benda may have suffered from depression and there is no doubting that the concerto is a remarkable and very dark work. After a long and dramatic orchestral introduction the violin entry is based on entirely new material, and the violin simply works up to a high A and holds it, whilst the upper strings are busy underneath resulting a fascinating series of textures. The whole work is full of these touches and having heard Pavlo describe the piece, and looked at his score, then I can wholeheartedly concur and look forward to hearing it. Kraus was a name entirely unknown to me. He was German but worked for Gustavus III in Sweden. Another very enlightened patron, in fact Gustavus gave Kraus some study leave and sent him to Europe to learn, during this tour Kraus seems to have met Haydn and who may have had a hand in the Kraus''s Symphony in C minor (Haydn said of Kraus, 'The symphony he wrote here in Vienna especially for me will be regarded as a masterpiece for centuries to come; believe me, there are few people who can compose something like that'). This is perhaps the most romantic work in the programme and was in fact included because it needs four horns. It was the suggestion of the oboist with the Academy of Ancient Music who was familiar with the work (he will probably be the only person present when the Academy plays it who has heard the work before), and suggested it because it used four horns like Mozart's G minor Symphony which is also in the programme. Mozart's Symphony No. 25 in G minor is perhaps the best known work in the programme. Mozart writes for four horns because he uses two in G and two in B flat, in order to give himself the requisite chromatic notes he needs (horns in G cannot play all the notes of a G minor triad). And in fact one of the themes in the work cannot be played on just one horn, and the two groups pass the melody between them. Something that would not necessarily be apparent in a modern instrument performance where the modern chromatic valve horn can could play the whole melody! One fascinating thing, when considering these works as a group, is that they all seem to use similar expressive rhetoric, the same types of wide intervals and other features crop up. Looking at the music in score makes you wonder what other linkages will be come apparent when we hear them performed together. Pavlo will be directing the concert from the leader's desk, which is something he enjoys. The music of the period was written to be directed in such a fashion, conductors as we know them were not used and music would be directed from the lead violin or from the harpsichord. Pavlo had learned by doing, watching what does and doesn't work with other people. He comments that something to guard against is doing too much with the bow, as this is by no means as clear as it might seem and that other gestures with the body or with the left hand using the scroll are far more expressive and clear. When learning to direct, it is tempting to do too much and you can end up not being able to play yourself. To show what is possible, he turns his chair around in the cafe and gives me a demonstration (rather to the consternation of the cafe staff), and I have to confess that I had not realised someone's back could be so expressive. Another interesting project that Pavlo is involved in is an exhibition of historic 18th century bows being put on by the auction house Tarisio. There is an interesting on-line component to the exhibition too. The exhibition L'Arche Revolutionnaire, will contain rare violin, viola and cello bows of the 18th century, featuring French, English and German bows by the Tourte family, Duchaine, Dodd and Pajeot amongst other celebrated makers (1-3 November 2015, Westbury Hotel, 2nd Floor Gallery, New Bond & Conduit Street, W1S 2YF). Alongside the exhibition there is a programme of lectures, masterclasses, and performances (27-31 October, Hinde Street Methodist Church, 19 Thayer Street, W1U 2J). Pavlo is involved in giving masterclasses which are intended to demonstrate the historic bows, and how the development of the bow paralleled and affected the development of music. Pavlo comments that there is rhetoric in both the baroque music and the late quartets of Beethoven but it is a different rhetoric, and the development of the bow helps relate to what was possible as music developed. So you will be able to hear, for instance, what a Corelli bow sounds like when played and why it is not suitable for later music. Pavlo also directs the Avison Ensemble, a group named for Charles Avison the Newcastle-based 18th century composer. 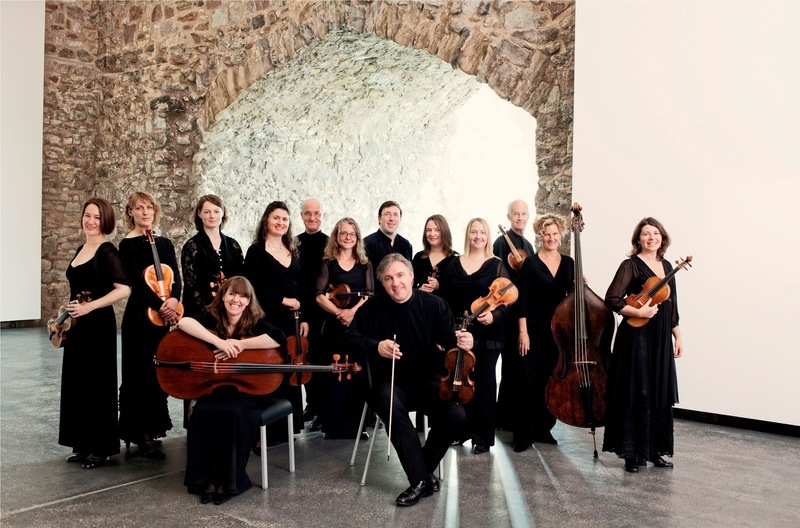 The Avison Ensemble is presenting a concert at the Grosvenor Chapel (6 October, South Audley Street, Mayfair) and at the Sage Gateshead (9 October,) entitled The Concerto in England with a survey of English 18th century concertos. Alongside Charles Avison's Concerto Grosso Op.6 No.9 in D will be a cello concerto by Avison's Durham-based colleague John Garth. William Herschel is best known as an astronomer (he discovered the planet Uranus), but in fact he came to the UK from his native Germany as a violinist and wrote a number of works and the group will be performing his Violin Concerto in D minor. Also in the programme is one of Handel's Opus 6 Concerto Grossos. The organ concerto in the 18th century is a peculiarly English form and the concert includes organ concertos by Handel and by the blind English organist John Stanley. Pavlo and the Academy of Ancient Music are also taking part in the Barbican's Sound Unbound weekend event (31 October - 1 November 2015), in which the Barbican erupts with a whole host of small classical concerts enabling audiences to attend when and how they like, including being able to have a drink and listen to good music as well. Their are presenting two concerts, both mixing the familiar and unfamiliar, on the Saturday afternoon the concert is themed on tempests and fireworks, including of course Handel's Firework Music as well as music by Locke, Rebel and Vivaldi, and they pop up again on Sunday lunchtime with AAM Voices and the BBC Singers performing Handel's Zadok the Priest plus Purcell, Roman and Quantz. Vivaldi - Concerto in F major "per la Solennitá di S Lorenzo"
Vejvanovsky - Sonatas "Sancti Spiritus" and "Paschalis"
Vivaldi - Sonata in E flat major "Sancto Sepolcro"
Manfredini - Concerti "Pastorale per il Santissimo Natale"
Biber - Passacaglia for unaccompanied violin "Guardian Angel"
Vivaldi - Concerto in E major "il Riposo per il S Natale"
Vivaldi - Concerto for violin in D major "S Lingua di S Antonio di Padova"